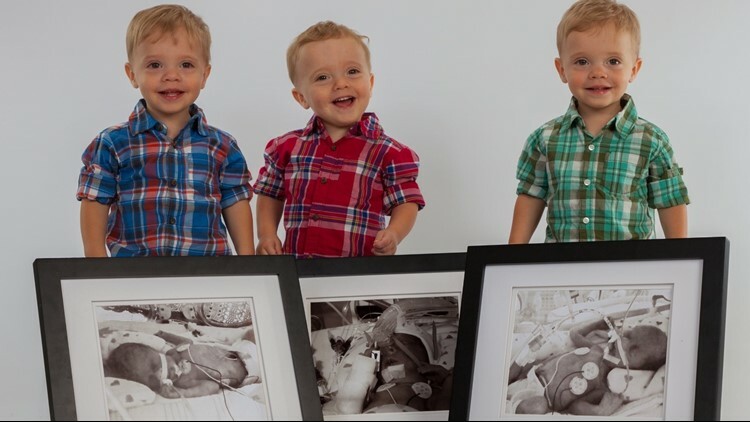 Triplets were a surprise for the Killebrews, but they got inspiration and hope from High Risk Hope's baby calendar of previous high-risk patients. Getting a baby to smile can be impossible. Getting his two brothers to smile at the same time? That’s even trickier. What other reason would Kevin Killebrew allow a stuffed teddy bear to be dropped on his head? The new father tried anything and everything to get his boys to smile for Steve Poisall’s camera. “There were three babies,” recalled Kevin’s wife, Bridget. Triplets was a surprise for the Killebrews, who live in Land O'Lakes. The first-time parents never expected three boys to be growing inside Bridget. Adding to the nerves, their doctor immediately termed the pregnancy ‘high risk.' They would have to travel to a different hospital for care. That’s where High Risk Hope stepped in. The non-profit specializes in comforting mothers with high-risk pregnancies. They fundraise throughout the year and create care packages for premature birth moms like Bridget. Inside each package is a calendar full of photos of previous high-risk patients. Included with the healthy, happy photo is the preemie one from the hospital. Hence Kevin’s run-in with the teddy bear. His boys, Jack, Charlie, and Ben, were getting their photo taken for the 2019 calendar. The photos have been taken by The Gallery Studios for five years. It’s a way to inspire families in the Bay Area. The calendars are sold online. Each child beams after some coaxing from parents and Poisall. The finished photos are gorgeous reminders of a group that helped mothers every step of their high-risk pregnancy. “That’s what you want to see but you’re still scared because it’s early on but to be able to be that for someone else, it’s going to be really cool,” Kevin said. The premature birth rate is 1 in 10 in the United States. That’s higher than any other high-income country. Premature births cost the USA $26.2 billion per year. 2019 calendars are available for presale now.